The mantra for a successful blog or website is traffic building. With the advent of Web 2.0 and worldwide acceptance of social media networking sites, the task of building traffic is now relatively simple — owing to “Sharing”. Everyone around is looking for some great and helpful content on Web, for boosting day-to-day productivity (specialized tutorials, new & smart tech solutions, geeky tips & tricks, product launches & reviews, exploring books and so on) and love to share the interesting stuff. You can provide them with easy and handy solution for sharing the content of your website/blog; consider installing the social sharing toolbar for your website/blog. Apture is keenly interested in facilitating “Search, Explore, Experience”. Apture is committed towards boosting the time spent by a visitor on your website/blog. Its information preview (on the same page) ultimately ties up your customers to spend more time on your web-page (searching for keywords on Wikipedia, YouTube, Google Images, Google & Bing search)and its text highlights help you a lot in understanding your visitor’s interests. Apart from its “Search, Explore, Experience”; it is equally dedicated at “Sharing”. It provides a smart social-sharing deck (at the top) to make sharing easy for your customers (with Facebook, Twitter and Email options). Integrate rich and interactive features to your website with Wibya’s Web Toolbar. Its services range from social media integration (with all the major market players — Facebook, Twitter, Yahoo, MySpace) to increased web-page views. It comes packed with various applications like smart shares, iTranslation, live notification and 3D photo galleries. Alongside it is customizable (for website owners and developers) and is regularly updated to come up with new and relevant additions and easily accessible for your customers (docked at the bottom). Optimize your social graph with Meebo Bar. Meebo Bar offers a simple, intuitive and clutter-free interface (placed at the bottom of your website) for sharing your website’s content on Facebook, Twitter, Yahoo Updates, Google Buzz and Emailing Applications condensed in “Share page” button. It integrates your fan/like page and twitter profile to the toolbar and allows your visitors to instantly connect to Gtalk, Facebook Chat and other IM and chat applications directly from the toolbar itself. AddThis Sharebar is the simplest toolbar in terms of integration. No installation and no user accounts — its just a “copy-paste” away. Copy the code provided (on the AddThis labs) and embed it to your page to get going with the cool features of the toolbar. It requires you to create an account only when you are interested in tracking the results with AddThis. The Sharebar integrates a sleek toolbar at the bottom of your website; with all possible socializing and searching options. Gigya is a social optimization tool for online business. It connects your site to all the major social networking sites, provides dynamic and compatible sharing plug-ins. It helps you in building a community around your niche through live chats, comments and activity feeds. It was the first and only toolbar service providing the social sign-on (for a perfect corporate and social network integration). Its free, its customizable and it means a lot to your website. Extendy lets you extend your websites capabilities and supports all the major blogging tools. WordPress, TypePad, Blogger or just about any platform. It provides you the freedom of choice — to choose from over twenty colorful themes and a dozen of plug-ins to best suit your websites personality. Searching for a simple and sophisticate solution; dedicated to social media integration? Well, the Web.Informer button is the best solution for you. its simple, powerful, user-friendly (with loads of social media options) and effort-free. Just select the style of the button, embed the code to your page and sit back observing the integrated Google Analytics for your sites increasing popularity. Internal linking is crucial to a website’s design and Snap Shots aim at utilizing the links in efficient manner. It previews the linked content on the same web-page; thus providing an ease to your visitors and avoiding them from switching between the tabs and windows for your site’s content. 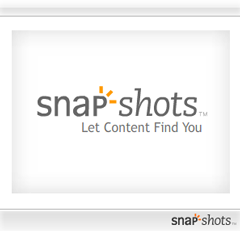 A simple “Share” button at the top (of snap-shot) simplifies the sharing over social networking sites. The result is thus, an enhanced user experience which goes a long way to help you build traffic. 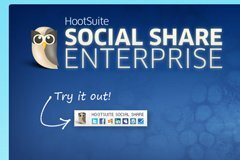 HootSuite Social Share comes packed with a suite of applications. Apart from posting/sharing messages across multiple platforms, it provides you ease of scheduling your messages, toolbar access to URL shortener, simplified file uploads, sophisticate campaigning and of course enhanced tracking and analytics. Integrate the social sharing options on your website/blog in a condensed yet powerful way with ShareThis button. The button acts as the single interface for your sharing across multiple platforms. You can add the button and accelerate your website’s page views in three simple steps. Firstly select the platform (your blogging tool — WordPress, Blogger, Typepad, any website), choose the button type and style (to match your theme or space utilization) and finally create an account (to fetch the button code and analyze social impact). Share your pick or suggest us more toolbars in comments. However, what about this? suppose you were to write a killer headline? I ain’t saying your information is not good., however suppose you added a headline that grabbed folk’s attention? I mean Website Toolbars — Increase Traffic And Integrate Social Sharing To Your Blog is kinda boring. You ought to glance at Yahoo’s front page and see how they write news titles to grab viewers interested. You might add a video or a related pic or two to get readers excited about what you’ve written. In my opinion, it would bring your blog a little bit more interesting.